Bobby invites you to RSVP to our 25th year here! Mike is the first GOC Council Member to introduce themselves to new GOC subscribers and welcome them to the GOC via video. Please click below to view video. We are thrilled and excited to be celebrating 25 continuous years of The Gathering of Circles. We are planning on a big year, with extra guest speakers, an earlier start, a welcome lodge for early arrivals among other exciting activities, new and old. But we need your help. Your GOC requires many volunteers, coordinators, and good-hearted people willing to step up or simply lend a hand. Experience the joy of service to yourself and others by helping out. There’s something for everyone’s ability or interests. It IS epic!, and as part of the celebration, we have invited three past Speakers from the GOC back to speak again this year. All three Speakers are recognized internationally as Elders and deeply connected to Spirit. All three have long histories of walking their talk, and communicating their messages to audiences around the World. For a long time I prayed and meditated over my decision to enter the Inipi, the traditional sweatlodge. My heart had to be right. It’s not a choice to be taken lightly. Not unless you are a fool and want to risk your physical and emotional wellbeing. Not to mention the risk you are taking spiritually. 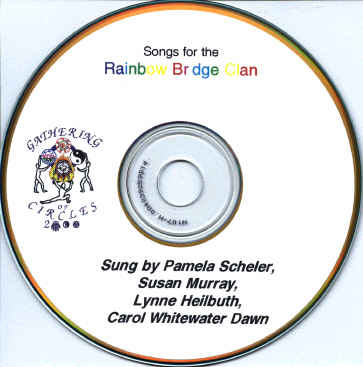 In the year 2000 four women got together and created a CD containing many of the songs sung at the Gathering of Circles. We have been singing them for years now. Instead of hearing them only at GOC events many hearts wanted to take them home, learn them and make them their own. A donation of $10.00 to the GOC will reserve your copy to pick up at the GOC event. If you wish, I can mail your copy to you. The initial CD has been re-mastered for better sound quality and separated into individual tracks. In addition four new songs have been added. Two from Tim Robertson and two from Reecee Wilkinson. 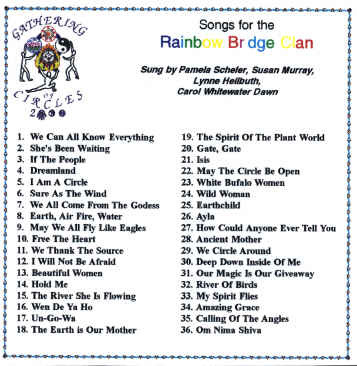 I would like to order the “Songs We Sing” CD. I understand that I will donate $10.00 to the GOC in return for the CD unless I already have the original release in which case I will donate $5.00.